How Much Do Gutters Cost in 2019? Gutters are a crucial part of your home to control water and moisture around the home and foundation. Adding gutters is an easy way to reduce the risk of water issues in the future and to protect your foundation. The average cost of a new gutter installation is $1,000, and the average range is $750 – $2,000. However, the material used and the cost of labor could add to that price. The linear feet of gutters needed, number of downspouts, and length of downspouts will also impact the price of the installation. Extras like gutter guards, screens, or underground drainage will also drive up the price of an installation, but could also reduce the cost of long-term maintenance or improve the system. The type of gutter material selected will greatly impact the price of the project, and some will require some professional help with the installation. 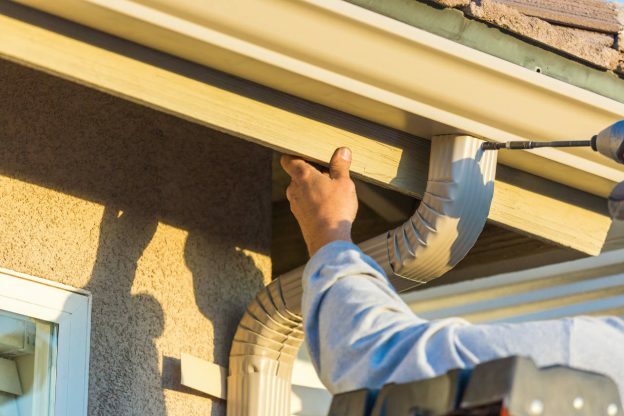 Along with the gutters and downspouts, you will also need hangers to hold your gutters in place, and roof flashing if the old flashing needs to be replaced. However, you could do this as a DIY project if you have the ladders, time, tools, and know-how. Vinyl gutters are probably the least expensive gutter material, and they do not rust. The downside to vinyl is that extreme cold or heat will affect it. Vinyl expands and contracts with the heat and cold. Therefore, this material is not recommended for extreme climate areas, and even in moderate climates, you will need to replace vinyl sooner than a metal alloy gutter. Expect to pay $4-8 for each piece of gutter and $5-15 for downspout extensions. Aluminum gutter comes in a variety of weights. Aluminum is more durable than vinyl but costs a few more dollars per piece. Figure $6-12 per piece for gutters and downspouts. Steel gutters are one of the most durable materials and last the longest. You can expect to pay between $15 and $35 per piece for steel gutter and the downspouts. Copper gutters will develop a unique patina as they age and look excellent, but the price can be prohibitive for some homeowners. Expect to pay $50-100 per piece for copper gutters, downspouts, and connectors. Although sectional gutters are cheaper because you can get them as stock off the shelf, seamless gutters cost a bit more, but there are no seams where leaks could spring up. Even well-caulked or sealed seams will breakdown over the years. If you can afford the higher initial expense, it is wiser to install seamless gutters. Whichever you choose, seamless or sectional, vinyl, aluminum, steel, or copper, get at least three estimates, and then choose a licensed and insured installer with references. One popular option is a clip-on mesh or screen. It covers the gutter so leaves and pine needles don’t get into the gutters and form a dam, which will eventually cause rainwater to overflow and defeat the purpose of the gutters. An alternative option is a foam insert that prevents obstructions in the gutter but is still porous and allows water to flow through it. For the price of one cleaning, you can have one of these options added. If you forego a solution to preventing leaves and brush from getting in the gutter be prepared to clean them regularly. You can likely get a local handyman service to clean them for $75-150. Another option is a pressure wash attachment that costs $25 or $30 on average. These attachments are quite long so you won’t even have to get on a ladder to keep your gutters debris-free. You might also be interested in more roofing resources, including information about roof repairs, new roofs, and our roofing calculators.